Was a time when laptop power jack repair was a complex and expensive undertaking, requiring a skilled technician to remove the old soldered in DC jack and solder the new one in. Well for the most part, that is no longer true. Most of today’s newer laptops use a wire with a plug that simply fits into a socket on the motherboard. Look at the below picture and compare it to the above photo to see the difference. While you still need a technician to disassemble the laptop to get to the motherboard, which is not easy, the laptop power jack repair itself is quite easy. For that reason, instead of paying upward of $200 for the repair, it can now cost as little as $90! A lot of people are a bit tough on their laptop power jacks, eventually making them loose or even breaking them off. You should be gentle when plugging and unplugging your power cord. Also, never leave the power cord plugged in when you transport your laptop. It will cause stress when you’re moving it around or when you put in your laptop bag. We see people come into our shop with the cord plugged in and we cringe at the sight. 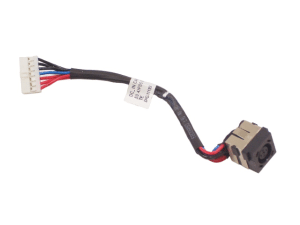 If your laptop’s DC jack is loose or broken, bring it on in to our shop. We’ve been doing this for over 13 years, so you can trust in our expertise. Bear in mind, each laptop uses a different type of jack. We keep the more common ones in stock, but we may have to special order one for you. This usually takes 3 days. Find out more about our laptop power jack repair service and our company in general at our Tucson Computer Repair website.